You see, these three bananas had been sitting on my counter for like, a week, and each day I passed by them, they looked a little more speckled. Each day, they looked a little more sad. Finally, I just couldn't take it anymore, something had to be done. These poor bananas, they couldn't just be made into some regular old banana bread. No, they deserved something special. I took some inspiration from the current weather situation here in Washington; not quite spring, but certainly not winter. I added a few spices like allspice, (which is such a perfect counterpart to bananas, I might add,) and replaced some of the granulated sugar with brown sugar to evoke the warm, wintry sweets that have all but gone out of season. I also decided to add in a handful of fresh blueberries, which not only created delightful pops of color throughout the loaf, they helped to balance the sweetness by adding an almost floral note to it. I think next time I might try it with a crumbly oat topping to really push it over the edge...oh, how I wish I had thought of that sooner! Thankfully, this bread is so easy to whip together, I don't need to wait until next National Banana Bread Day to make it! 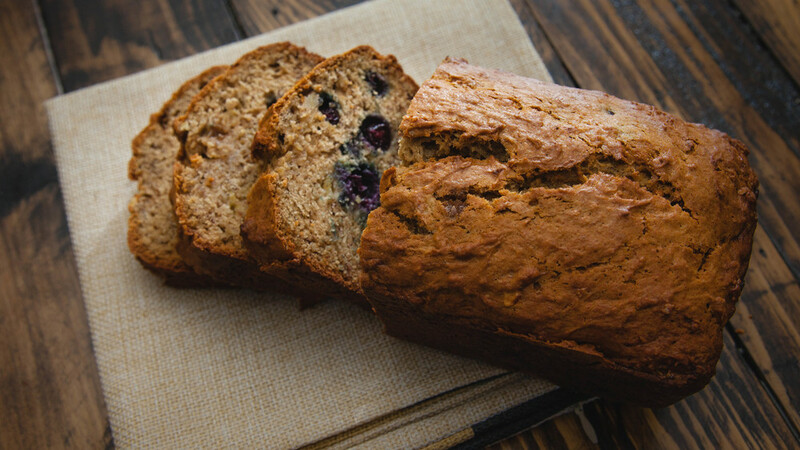 Leave your comments below on your favorite banana bread. Are you a purist? Like switching it up a little? Are you nuts about walnuts? Can't wait to read your replies! Tip: Lightly dusting your berries with a bit of flour will keep them from sinking to the bottom of your loaf. Preheat oven to 350F. Lightly grease a 4x8 inch loaf pan. In a medium mixing bowl, whisk together the flour, baking soda, salt, and spices. Set aside. In a large mixing bowl, mash bananas with a wooden spoon, leaving a few lumps. Add the melted butter and both sugars to the bananas, mix to combine. Add the beaten egg and vanilla, mix to combine. Begin adding your dry ingredients to the banana mixture in thirds, mixing until mostly combined each time, (don't overmix!) When the last batch of flour is almost fully incorporated, add in your blueberries. Gently fold the berries into the batter, being careful not to squish them. Pour batter into prepared loaf pan, spreading evenly throughout. Giving the pan a tap on the counter before baking will remove any air bubbles trapped in the batter. Bake on the center rack of the oven for 50-60 mins, rotating the pan at around 30 mins. The bread is fully baked once a toothpick inserted near the center of the loaf comes out clean. Allow the loaf to cool completely before slicing. This loaf will keep for 3-4 days wrapped tightly in plastic wrap or stored in an airtight container.